I am not sure how to feel about “All-Star Superman.” Perhaps if I had never watched the recent animated masterpieces “Superman/Batman: Apocalypse” and “Justice League: Crisis on Two Earths” I would feel at ease with what I just watched, but I am not. It’s not that I didn’t enjoy the movie. I did. I loved the great imagination and fun behind it. But what troubled me a bit was the fact that so much seemed out of place in this story. I loved the art, it was perhaps the most realistic interpretation up to date. But like I mentioned before, this movie does not fit with its previous line of DC animated movies. This was a fresh — and not necessarily good — start; a different Superman story telling all together. One where Kryptonite is all but irrelevant, Lois acts like a child, and Lex Luthor has a good side. This is why I have chosen to start by pointing out some of the main complaints the fans had with the comic book series on which this movie is based. In my research, I found they complained this story was “childish and incoherent.” I also thought it was pretty rough the way they bombarded the web with insults to the writer for his work on “All-Star Superman.” It was disrespectful and I am not going to partake in it. Especially since the Michigan-born writer, Dwayne McDuffie (Feb. 20, 1962 to Feb. 21, 2011), died Tuesday, the day the movie was released. Now that I have watched the movie, I have come to realize some things. First, I watch these amazing DC Comics animated movies for two important reasons: the art and the action. The art, because it is my first true love. I am an artist before I was a writer. It’s what I have always enjoyed and I feel I’m good at. And the action, because watching these amazing comic book stories come to life is more than priceless, it’s a dream come true. Comic book stories are the most imaginative action-packed stories ever told. It turns out there are other factors I took for granted, probably because these stories are always treated with such respect and detailed attention I need not expect any less. But with “All-Star Superman,” there is some chaos for me in the story. I must say I was slightly disappointed in that this film felt like a bunch of smaller stories all put together with one similar theme. See, Superman is dying and the movie follows him in the events that occurred in those last few weeks. The thing is, though, you only have one hour and 16 minutes. That is not nearly enough time to cover all the different people, aliens, monsters, Kryptonians, threats that he will encounter in that time. But, I must say, this is basically how it was in the comics and they were true to the story (while obviously leaving a bunch out). However, what works in a 12-issue comic series doesn’t necessaryly translate to a short film. Superman was definitely as super as he could be in “All-Star Superman.” He looked great and he was not powered-down to balance the story out with other less-powerful beings. He was actually powered-up — to the point that it would actually kill him. His body actually became his own worst enemy. So, with very little time left, he goes and fulfills his bucket-list of things he always wanted to do, including revealing his secret to Lois. I enjoyed all of Clark Kent’s moments, as well. They made him out to be the bumbling klutz he was in the Christopher Reeve movies. I also loved how Clark Kent was drawn, he looked totally different than Superman, yet still didn’t look “bad.” James Denton (“Desperate Housewives”) did a good job voicing our hero and I had no complaints there. Christina Hendricks (“Mad Men”) was great as the voice of Lois Lane, and I also have to give props to the art department for creating such a beautiful rendering of this character. She looks amazing. I also love the fact she was able to have superpowers for 24 hours and actually take the mantle of Superwoman. But this is the extent of what I like about Lois Lane in this story. I was really disappointed with her story-telling –specifically her attitude and behavior. Lois Lane is not this petty little girl who asks Superman to arm-wrestle two guys for her affection. She is a driven heroine on a mission. This Lois Lane was apparently on vacation from everything that drives her. She wants after any story or the truth, she was just there, celebrating her birthday. Sorry, this was weird to me. Lex was also not too convincing, character-wise. He seemed to be protective of Clark and mankind. Yet he is jealous of Superman and wants to destroy him. Anthony LaPaglia’s voice was spot on for the character and it was enjoyable to hear his take on Lex. I covered these three characters for they are the main characters of the movie. But there are so many, many more. I guess this is a movie you can enjoy if you have never watched any of the previous DC animated outings. Or if you are one of the many that enjoyed the comic book series. There is lots going on here, so check it out. I actually bought it, so I will give it another go in the near future and see if I feel differently about it. Follow Josue Sanchez on Twitter at http://twitter.com/Josue_can. I totally agree with everything you said! I wanted to like this movie so much more than I did. There were things I liked and things I didn’t, but the thing I disliked most was the use of Ed Asner’s voice for Perry White. If he had never done a DCU movie before, it would have been fine. But he has been used as Granny Goodness so often that it was distracting to me. I thought the three main leads were very well cast though. Oh, and the figure included with the Best Buy exclusive version is excellent. 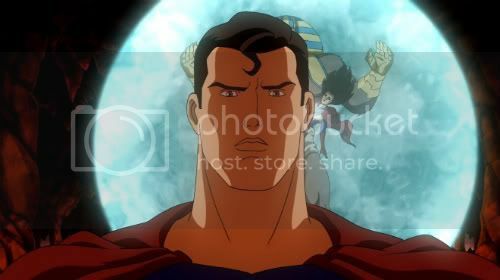 I also got a chance to watch this movie and although there were parts I liked I didn’t feel that it had the epicness of the most recent DC full length feature cartoon “Superman/Batman: Apocalypse” did. I thought the story was interesting but with so many people and creatures featured, it felt that each character was watered down to its most basic to make time for all. Personally I would have been ok with this movie being an extra hour longer to expand the depths of each character. Very interesting points, I agree with you especially at Lois and Lex. With Lex, I have always imagine Lex hating Clark as well so that felt weird. Lois was suprising as well, you were right on that she wasn’t the classic Lois Lane that we are all used to. “Personally I would have been ok with this movie being an extra hour longer to expand the depths of each character.” I agree on that as well, I thought before this movie was released that it would be longer since it’s based on a comic book series that is very popular. I think I will get the All Star Superman comics to get more deep into the story.